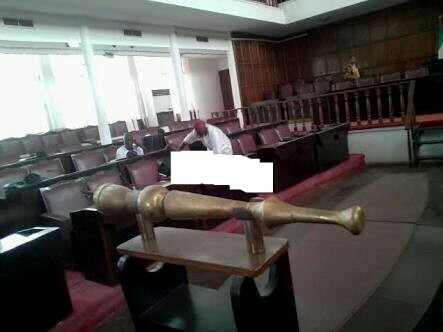 The struggle by factions of the Anambra State House of Assembly to take possession of the seat of the Speaker on Thursday caused a fight in the hallowed chambers. Both factions of the House, led by their separate Speakers had arrived the State Assembly complex at about 10am in the morning, but could not sit for plenary because of the tussle over which of the two Speakers should preside over the house. About 22 out of the 30 members of the House had three weeks ago impeached Speaker, Mrs. Rita Maduagwu, replacing her with Hon. Ikem Uzoezie. But she had quickly denied being impeached, while the Uzoezie faction insisted she remained impeached. At about 10:30pm on Wednesday, police unsealed the complex ahead of Thursday sitting, but, both factions went inside to administer the House. Mrs. Maduagwu had first entered the hallowed chambers and sat on the Speaker’s seat, but later left when she found that only two of her supporters were present. At about 2:30pm when she returned to preside over the House, Uzoezie had already taken the Speaker’s seat, refusing to give way for Maduagwu, causing a huge uproar in the House. “You are not ashamed of yourself, you were schemed out of the party’s primary election in your area and you could not do anything,” Emenaka yelled at Obi. Obi was, however, urged by members of his faction to keep calm and not reply. It was gathered that all the pro-Uzoezie members of the House are those denied ticket by APGA to either return to the House or move over to the House of Representatives. As at the time of filling this report, all the lawmakers have refused to leave the chambers, with Uzoezie sitting tight on the Speaker’s seat, while the refusal of the clerk to make available the mace was still stalling Uzoezie’s attempt to preside over the House.